First off, all the uniforms are silver, regardless of the teams' color palettes. In fact, no discernible trace of any of the teams' color palettes is visible. 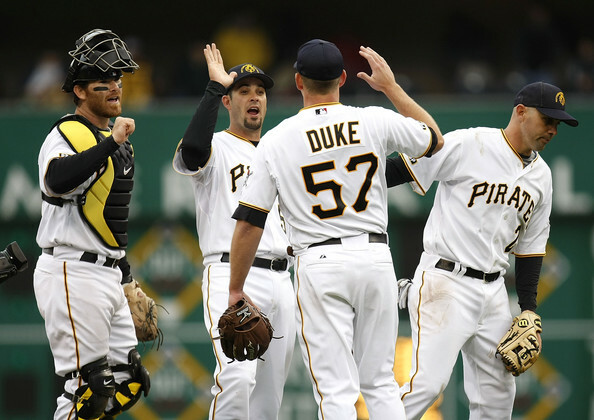 Other than that, the uniforms are essentially the same as each team's typical gear. All the important typography, such as school name, jersey number (front and back), and the name-on-back, is white! I feel bad for the NCAA referees on this one. Basketball, by nature, is a very difficult sport to referee. The players move fast, jump high and soar through the air. In fact, this very argument was used to ban the use of this numeral style. How did Jordan get the concept of white numbers on silver approved? Dark typography would have certainly improved these uniforms. In branding terms, this was a move that took a good amount of audacity. Even though it was only for one game, Jordan Brand was essentially asking each team to put an equipment supplier (albeit a large, lucrative sponsor) ahead of the school's brand. UNC didn't look like UNC when they donned the über-reflective duds against Florida State. Cal didn't even look like a PAC-10 team, let alone Jason Kidd's alma mater. The Georgetown version was probably the best because the Hoyas already have a silver uniform. All in all, I'm glad we'll have to wait another 25 years to see the gold version. In other news, after watching a good amount of Olympic hockey, I really enjoyed the TV numbers on the shoulders of the teams' jerseys.The NHL generally places the numbers slightly lower on the sleeve, but the higher placement made the numbers more visible and less prone to being covered by jersey wrinkles. Some, naturally, were executed better than others, but overall, it was an interesting nuance. 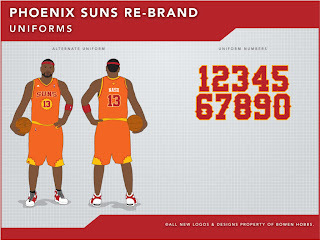 This week's design is for the Phoenix Suns. 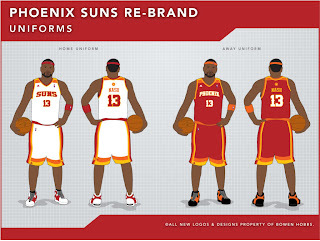 One of the issues with the Suns' brand is the color palette. While the rest of Arizona's pro teams utilize a deeper shade of red (similar to Pittsburgh's city-wide black-and-gold) the Suns use purple and orange. The problem is they are one of three teams in a five-team division sporting purple. With that in mind, I decided to go with cardinal red, orange and athletic gold for a fiery scheme that represents the nickname. The primary logo is a sun on the horizon (established by the wordmark) with rays coming out from the basketball. The typeface is a custom font with a Western feel. The secondary logo is a circular mark of a sun and basketball, while the tertiary logo represents the city name, Phoenix. The uniforms sport a classic feel with a modern twist. The shoulders feature a striping pattern that is also seen on the shorts and exudes the "heat" associated with the sun. The secondary logo appears under the back collar, while the tertiary mark is found on the left leg of the shorts. The alternate uniforms use a throwback feel with a sun behind the front number and sun-shaped inserts on the shorts. Feel free to leave a comment on Jordan Brand, Olympic hockey, the design above or anything sports-design related. Let's Party Like It's 1929!